Guthrie Douglas manufactures a wide range of high-quality skylight blinds and rooflight blinds for a range of commercial applications. They provide superior temperature and light control whilst having minimal effect on the building’s aesthetic appeal. 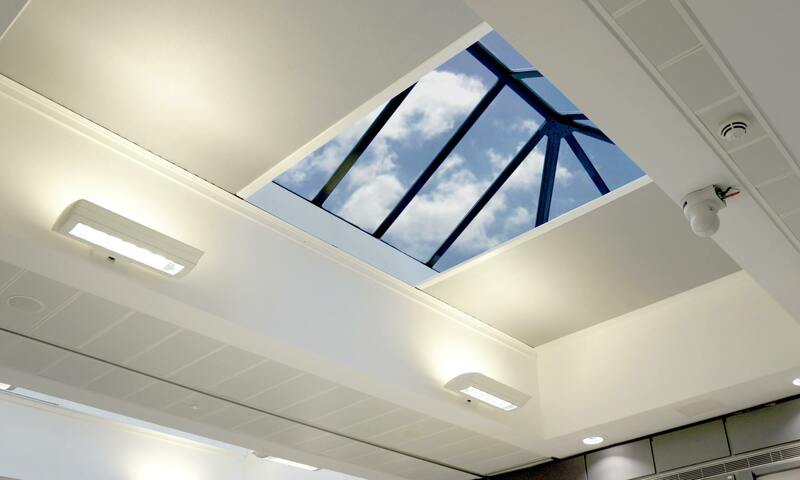 Why apply blinds to a skylight/rooflight? Large areas of glass can significantly add to a building’s character. However, at the same time this can also create significant challenges when it comes to solar shading. Skylight windows and rooflights are a quintessential part of many building designs. They use a glass flat roof to open up what would otherwise be dark spaces and flood areas with natural light. If these areas are left unchecked, the spaces underneath them quickly become too hot and too bright. When it comes to shading, we know the correct system is dependent on building design, material and solar direction. Blackout fabrics and tensioned systems can be concealed within the frame for roof and window blinds that provide an elegant finish. We have helped hundreds of businesses maximise energy efficiency and improve employee morale through effective shading. Our skylight blinds and rooflight blinds are also strong enough to cope with extremes in both temperature and wind speed. Guthrie Douglas create blind systems tailored to your individual requirements. We do so by taking you through the entire design process from conception through to installation. Our skylight blinds and rooflight blinds can be designed for a variety of configurations with unlimited colour finishes. We also provide a wide range of fabrics and controls that are available to suit any building design. To find out more about our ranges of skylight blinds and rooflight blinds, contact us at our head office today.